Like it or not we are all salespeople in one way or another. Whether it’s selling ourselves to get a job, selling a house or a car, or even simply to get through the working day, we all sell at one point or another. So why is it then that a lot of people hate ‘selling’? Perhaps it’s the word selling itself? So if that’s what we hate, what might we like? But what does this mean for salespeople? 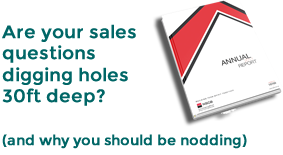 It’s very easy to say we should sell to meet needs, but what does that look like, particularly when our sales manager is breathing down our neck looking for results? Yes you want to sell more of your products and services, of course you do, but you won’t do that by behaving in some or all of the ways in the first list above. Get to know your customers, build trust and familiarity and aim to fully understand their needs at all times. It’s not about you, it’s about them!